Raiha had dreams of owning her very own book café since her days as a student in San Diego, California. She had never heard of one before, so she was in for the best kind of surprise when she accidentally walked into one during a stroll along a lake. 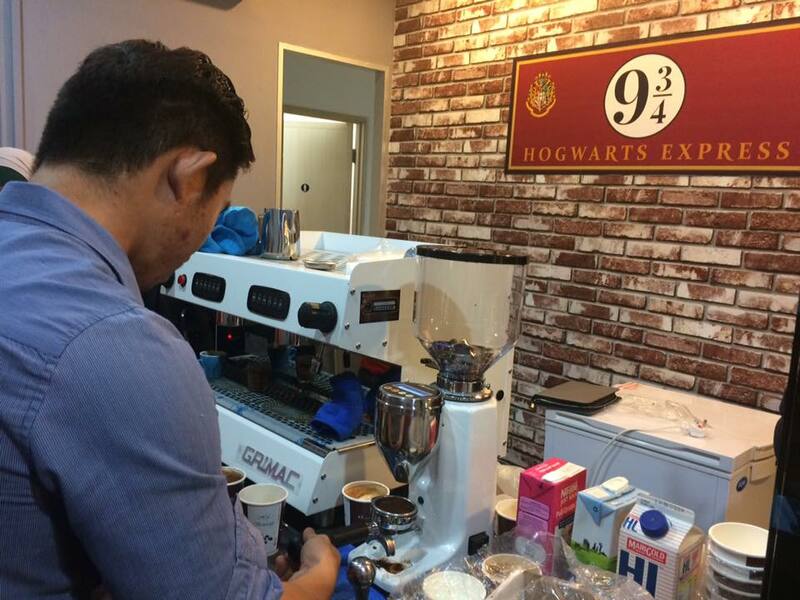 So I’m probably not blowing any minds here when I tell you that Malaysia’s first Harry Potter-theme café was built by a bookworm. Now 47-years-old and a mother of two, Raiha has gone ahead to realise this dream after a whole career of working in various industries—including a fond past in the education field. “The challenges I see would be promoting reading among the community in the era of wireless technology. Since I was an educator once, I see that this is quite an issue. Kids nowadays are doing less reading. My future plan is to promote reading among them, to encourage them to come to my café and pick up books,” said Raiha. 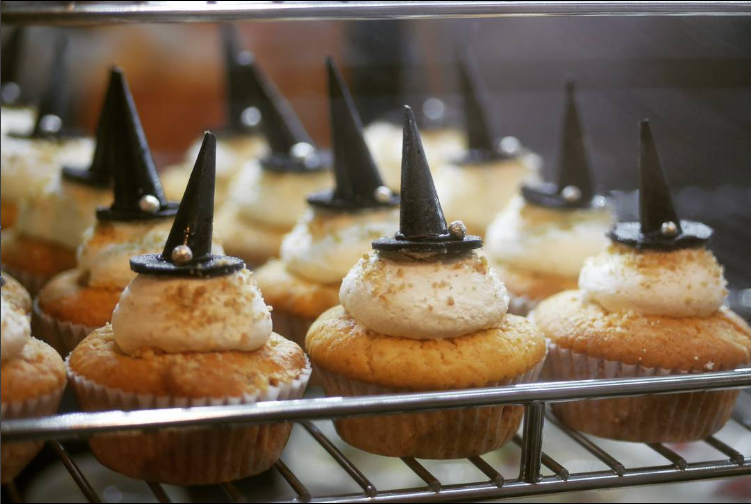 With a goal that would bring a tear to a schoolteacher’s eye, it makes perfect sense that she is the visionary behind Hedwig Books & Café. The location had just launched last Saturday, yet it already receives media attention for its concept, and more than 500 likes on its newly minted Facebook page. 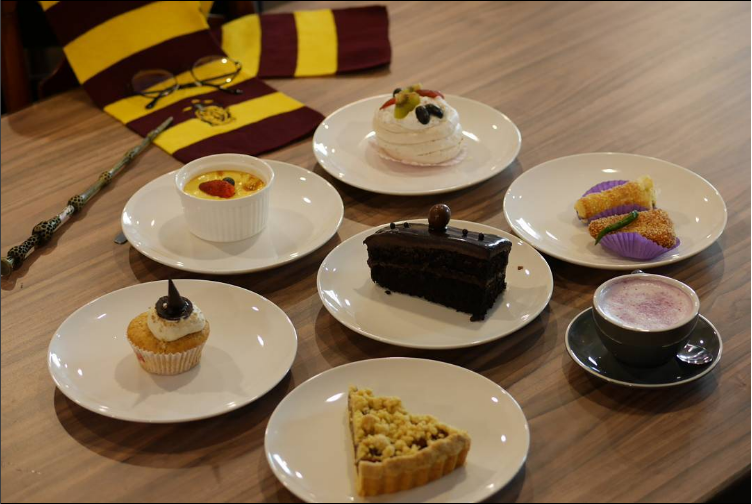 The quirky café provides a Hogwarts-inspired space that is the brainchild of one poor designer who had to spend hours scrutinising the movies before she could provide a suitable mishmash for Raiha. 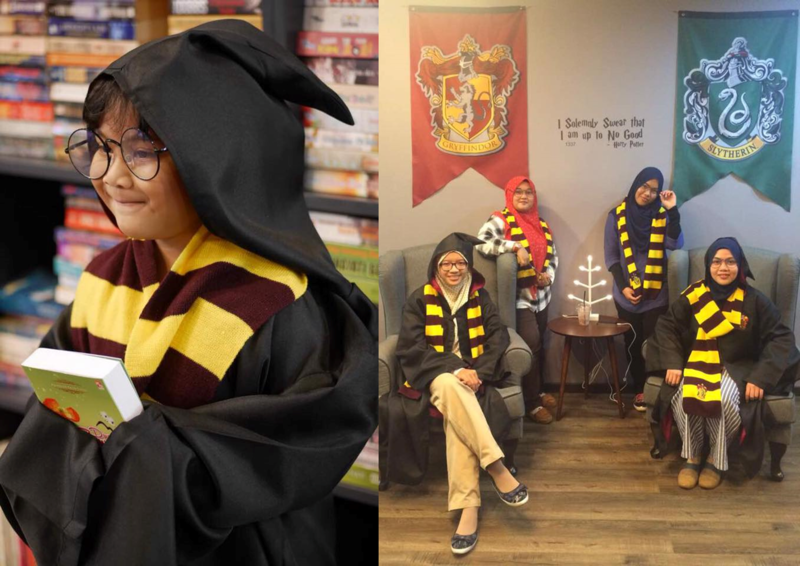 Since the Kota Bharu-based space already looks like it belongs in the Harry Potter universe, Raiha simply accented it with robes, mufflers (only Gryffindor, boo), wands, and round glasses for kids and Potterheads alike to finally know what it’s like to receive their Hogwarts letter. Well, not really, but at least they can live their dreams in photos and Instagram. It took Raiha nearly RM200k to achieve a space that lives up to her vision. Raiha didn’t just have a cool thousand to spend in her bank account on a whim, though. She had moved to Kota Bharu in 2005 to start an education-based franchise business. While she spent the past 12 years focused on her business, she never forgot about her dreams, watching her collection of books pile up at home. So she sold the business, and sank all of that money into a small shoplot up a flight of stairs. Whether there is a cupboard under those stairs or not currently remains inconclusive. 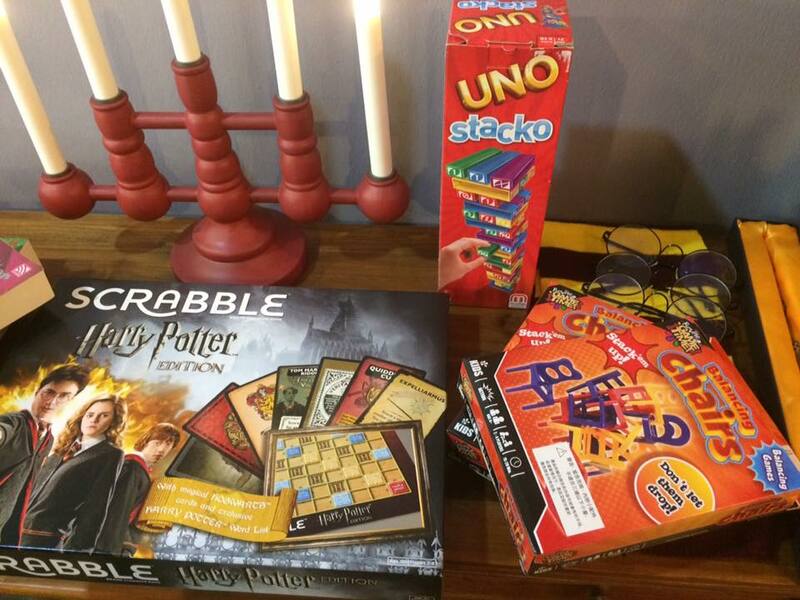 The shop contains painstakingly recreated murals of Hogwarts crests, a door based on the London Underground, and even an approximation of Platform 9 3/4. The most important feature though, is the large wall of books populated with Raiha’s own personal collection. Over the years as a reader and a parent of readers, Raiha has accumulated books from all genres, and has even supplemented it with books from warehouse sales and friends. 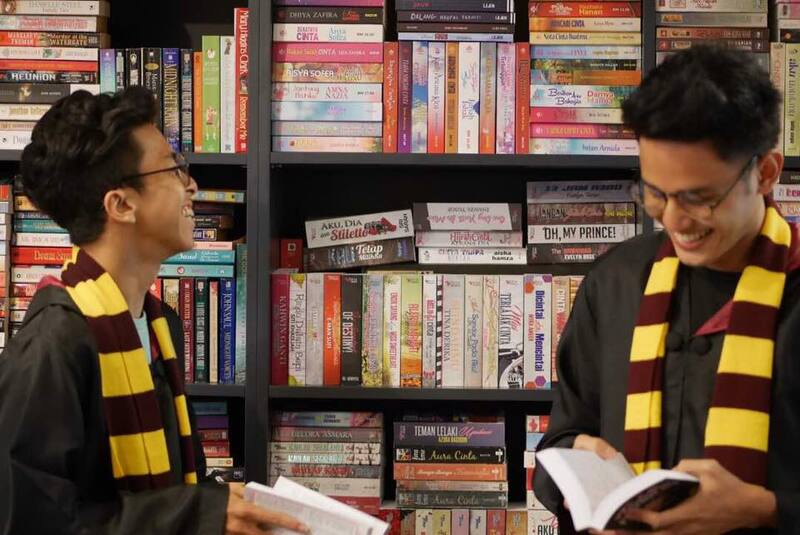 And yes, Raiha has Harry Potter on those shelves too, in both English and Malay. The genres range from romance, thriller, Sci-Fi, kids books, to even cooking books, in English and Malay. 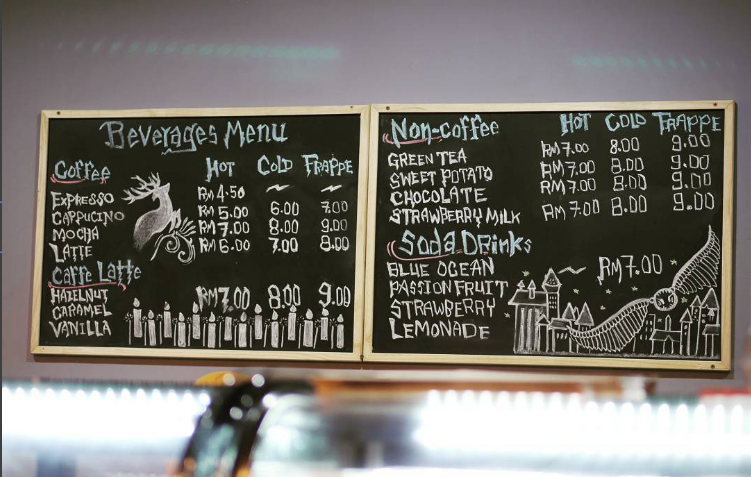 Meanwhile, guests can expect to pay between RM4 to RM9 for drinks, caffeinated or otherwise. For delicacies like cakes, pastries, pudding, pastas and pies, you’ll be looking at paying between RM2 to RM18 for each. Sorry Potter fans, you won’t find Cockroach Clusters or Chocolate Frogs. Yet. 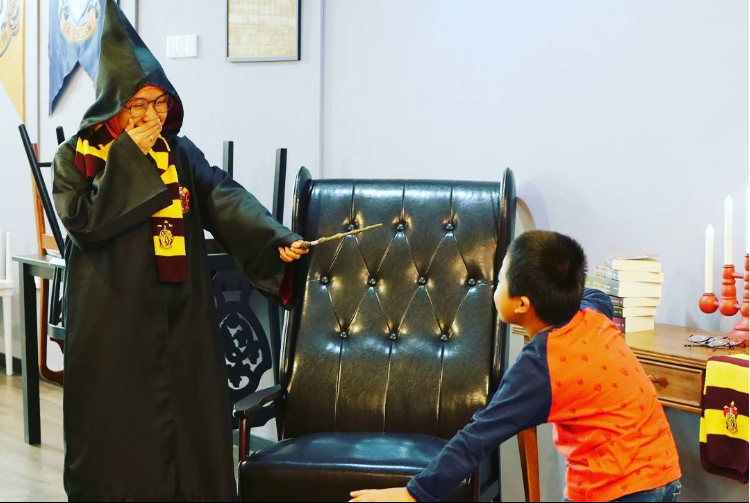 And here’s the kicker: Raiha isn’t even a Potterhead—her eldest son is. Sure, Raiha is indeed a fan of the books. But perhaps since she’s older than the generation that grew up with the series, she was more comfortable calling her son the Potterhead. In fact, it was Raiha’s son who came up with the name ‘Hedwig’. Even though Raiha admits that business would thrive in a Klang Valley location, she still chose to set up shop where she lives in Kota Bharu, which has been her home since 2005. Better for her too, since she hasn’t seen any of such cafés in Kelantan yet. 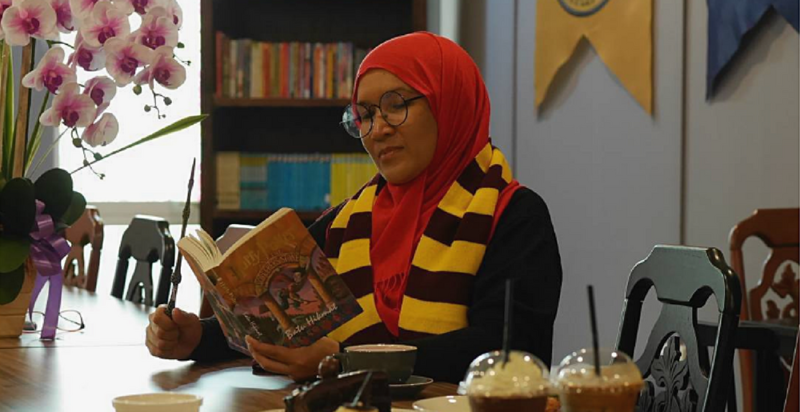 With a six-strong team and a newly minted business, Raiha is going to be focusing her energies on keeping this dream alive—especially her vision of introducing more kids to the love of reading. And she’s going to be relying on her small squad to multitask, with everybody trained to do everything in the store. “I plan to have activities like storytelling, colouring contests, collaborations with local art studios to conduct art classes and many more in the works,” revealed Raiha. Anyway, if you’re a KL-ite despairing how far the café is though, the future isn’t as grim as the last three books in the HP series. 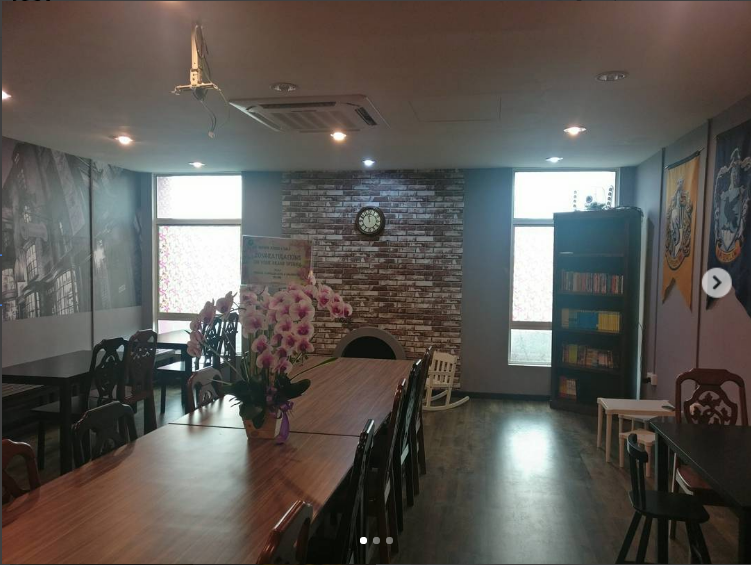 Besides speaking about expanding her book collection and menu, Raiha also said, “Since opening the café last Saturday, we received many requests to expand the business to KL, so I guess it will be one of the plans”. Don’t break our hearts, Raiha.